Fall in love with Paris at the Hotel Paris Opera, located in the heart of the city in a magnificent 18 century building. Full renovated in 2017, this boutique hotel with 71 rooms is convenient to the Place de L’Opera, Place Vendome, the Louvre and the Bacilica de Sacré-Couer in Montmarte. 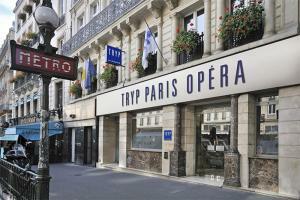 Located in the heart of Paris, on Montmartre boulevard, and near the Place de l`Opéra.